One of the areas that seems to be most challenging to people, groups, and organizations is finding and using an effective goal setting process. The graphic above is the process used by in-the-know businesses and interestingly enough, by educators and professional athletes. The best way to think of the entire goals setting and achieving process is that it’s like a road trip. Before we get into that, there is one critical step that is not on the map. Values have to come first. After the initial set of values is determined – I say initial as they can change or evolve, especially in groups – road trip planning can begin in earnest. Step 1 – Where are you heading? That would be your vision. In a real road trip the vision is usually a real place. In any other kind of goal setting process it is most likely an ideal future state. That’s ok, moving toward it – the journey – is the important part. Having a compelling, vivid, if not realistically achievable vision will keep you moving forward. You should have one overarching vision for your life or your group or organization and then sub-visions that describe and keep your vision alive in specific areas. Example – A company called YourBestFriend has an overall vision of a world where everyone had at least one good friend. To borrow from Meredith on Grey’s Anatomy – Everyone needs a person. They also had a vision specific to customer service and another vision around company culture and how they treated each other. The big vision and all the sub-visions were based on their values and all the visions aligned driving them in one direction. In addition, everyone in the company knew what the visions were, so everyone kept moving in the same direction. Step 2 – Figure out where you are now. On a road trip, you probably know where you are starting from. Uhm.. I’m at home. If you are setting goals for an organization, knowing where you are, in relation to your vision, may be a bit more difficult. Regardless of the challenge it’s a critical step. Step 3 – Choose a destination. If I want to go to Toronto – lets pretend that’s the vision – I might set a goal of driving to Calgary on the first day. That’s specific, measurable, achievable/acceptable, realistic (in summer) and I have time framed it. In an organization I might set a goal of increasing inside sales by 20% by the next quarter or of ensuring 50% of employees take one new training session within the next two months. Step 4 – Chunk it up! Objectives are the smaller steps you take to reach your goal. Get gas – that’s an objective. Buy a map – that’s an objective. Some would say these are also tasks and they would be right. Objective are the small, behavioural things that you have to do to reach your goal. In an organization objectives might include – have a meeting with all staff to share the goals to gain buy-in or send sales staff on training. The last step is documenting your travels. One thing I notice, a lot, is that organization fail to document in a way that makes sense. A lot of the time they become their own worst enemy simply by failing to report out based on the above process. Here’s an outline to follow for reporting progress. 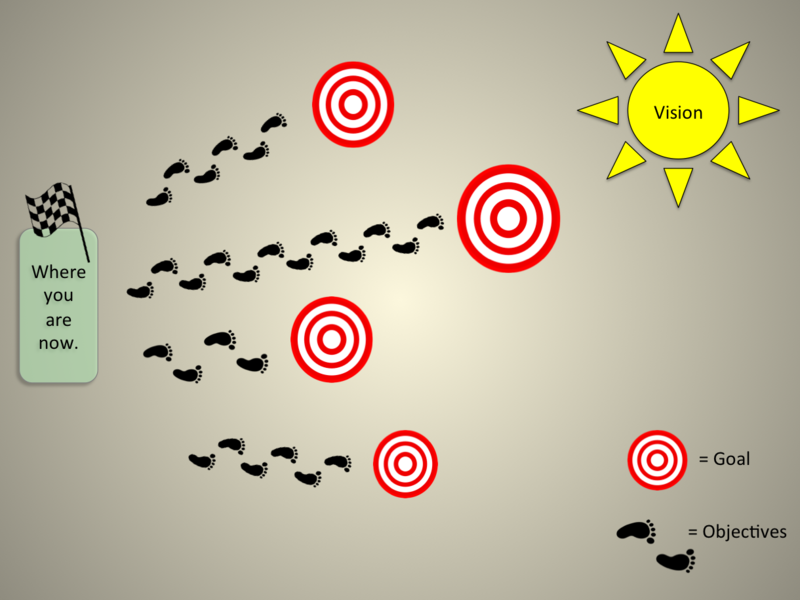 Report on each area that you set goals in and start with the vision is each area. Our vision in this area is ________________. Current situation in this area _______________________. Our goals in this area – list each separately. Progress on objective 1 __________________________. Progress on objective 2 __________________________. Progress on objective 3 __________________________. Progress on goal overall __________________________. Given that it’s homelessness action week we can use as an example, a common goal for non-profits and government organizations concerned with poverty and homelessness. Our vision in this area is that every person and family in BC has access to affordable and safe housing. Current situation in this area is that 40% of persons and families pay more than they can afford for housing, leaving them at risk of homelessness. Our goals in this area. Goal 1 – Raise awareness through educating the public. Objective 1 for goal 1 – Create a set of infographics that explain housing affordability issues in a way that is really easy to understand. Progress on objective 1 – Three infographics were produced and distributed through social and regular media. Progress on goal and new current situation for this area as demonstrated by an online survey is that we increased the public’s awareness and understanding of the challenges in this area by 25%. Whoo-hoo! You might want to leave that last bit out. Strategy is the how. It’s the vehicle and route you are going to take. It’s the way you are going to drive the car – slow and careful enjoying the ride or are you just going to get there. Strategy is big enough and important enough to warrant its own post. More on strategy later. You have it now, right? Now get out there and set some goals!